I am sorry everyone for a disappearance from the blogsphere, this summer has been one of the greatest but also time consuming that I have ever experienced. This week I have been getting back into the swing of things with school starting but most sad of all my beloved laptop, Emily has been not behaving in a way that provokes me to love and good deeds. Apologizes aside, here’s some thoughts to think about as we go about this glorious three day weekend. This week I have been closely watching the DNC convention that has been taking place in Denver, mostly because the Olympics are over and there is nothing else exciting on television. I’ve noticed that there has been an increase this year not only in this polical party but in many political parties they are trying to reach-out to religious voters. At the outset this might not seem like such a bad idea but my problem lies with the way they are going about it. Many political parties speak about Jesus and His life, but I think that both political parties have missed the point of who Jesus is. We read in the book of james that even the demons know God is one and in the book of Acts, when some men tried to use the name of Jesus to exorcises demons, but it didn’t work. The point of all of this is that I think if we do not get Jesus right, we completely miss the point of biblical Christianity. Think about it, if Jesus did not come to be the sacrifice for sinners, we would still have to work to achieve our salvation. Even the name of our religion comes from Him, so mess with the founder of our religion and creates him to be something he is or is not can be very dangerous. I think it is disappointing when many people who profess they are Christians but when it comes to describing the work of Jesus, they are misguided. Jesus’ works or miracles cannot take place on a higher field than His work of dying on the cross for our sins. This is why he came, was to satisfy his father’s plan, which was to bring sinners to his side and call them children of God. I think it can be truly hazardous to our faith if we only look at the good deeds of Christ and say that is who Jesus is. Christ didn’t just come to heal the sick, feed the poor and walk on water, He was the promised one to crush the serpent’s head and become the suffering servant. His work is to be the righteousness of the unrighteous, his gift is both for the republican and the democrat, the happy and the sad, all who call on the name of Christ will be saved, not just the ones in low estate but the ones who appear that life is all together. 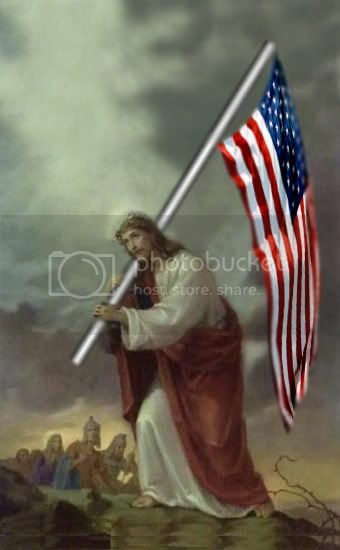 Please understand I think we are to live our lives in accordance to what we read in scriptures but I don't think Christ should be used as a savior for either political party or even us as Americans. Christ came and died and rose again for His children, which are scattered all across the US but also around the world. “Jesus shocked the established authorities by being a friend to all—not only to the destitute and hungry, but also to those rich extortioners, the tax-collectors, whom all decent people ostracized … The shocking thing was not that he sided with the poor against the rich but that he met everyone equally with the same unlimited mercy and the same unconditioned demand for total loyalty. 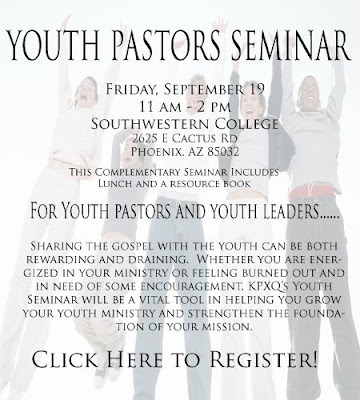 Just a quick note to let everyone know that I will be speaking at the upcoming Youth Pastors' Seminar sponsored by our friends at KPXQ radio. Please pass the word to anyone and everyone you know who works with youth! It's September 19 on the campus of Southwestern College. My topic will be Today's Youth Culture vs. a Biblical Worldview. One of the things I've mentioned more than a few times — here on the blog as well as on the radio show — is that most Christians today don't really know what they believe beyond a generic, vanilla brand of faith which nearly every Christian can agree with. And now it appears the even Chuck Colson agrees with me ;~). He writes: “Most professing Christians don’t know what they believe, and so can neither understand nor defend the Christian faith—much less live it” (p.9). I was impressed and in concurrence with Mr. Colson that the foundations on which our faith is built are largely ignored or lightly touched upon within the Western Christian world; namely the U.S. and Europe. He identifies the historic foundations on which our faith is built and then brings a relevancy to them with his personal experiences and stories of contemporary figures. The Faith defines faith as “more than a religion or even a relationship with Jesus; the faith is a complete view of the world and humankind’s place in it” (p.28). Colson sticks to orthodoxy in his explanation of tenets and doctrines without the pluralistic overtones taken by many of today's religious leaders. Colson pulls no punches and takes no prisoners while explaining issues about Jesus and the Trinity. On occasion, he even takes on Christopher Hitchins and Richard Dawkins who have attacked Christianity with an almost religious fervor and zeal. Colson doesn't stoop to their level; however, he avoids hate mongering and keeps a cool head while pointing out where their logic fails. At church last Sunday, several of us were talking about the opening ceremonies of the Olympics which we had all watched just the Friday before. We were all impressed with the pomp, the pageantry, the theatrics, the sheer magnitude of the Beijing ceremony. I had heard that there were roughly 10,000 (or 15,000, depending on the source) individuals involved in the event. TV commentators mentioned afterward that this was by far the best, the most impressive opening ceremony they had ever witnessed, that China had raised the bar to a whole new level, that London (host to the 2012 summer games) would have a tough time matching Beijing's ceremony. Eventually, our conversation turned to heaven. One man—a first-time visitor to our church—mentioned that compared to the Olympic ceremony, heaven would be even MORE impressive because "eye had not seen nor ear heard" anything quite like what we were going to see there. Several people agreed: heaven would be even more amazing, filled with even more pageantry and beauty. Then we heard a dissenting voice. One man raised the question: Will heaven be all "pomp and circumstance," or will it be simple—even barren—compared to the Olympic event? Would heaven be all pageantry and theatrics. . . or would a grand ceremony take away from the real center of attention, Christ the King? He wondered out loud if the marriage feast of the Lamb would be simple food—rather than rich and sumptuous—so that the meal itself didn't draw our attention away from the Host of the meal. What do you think? Where would you rather spend eternity—at the Beijing ceremony with its grand ceremony and glitter—or in a quiet, simple, even austere—heaven? Some time this week I will have lived longer than my father. I have now seen three generations of my children and it would be a pleasure to have the third generation increase. I have no memory of my grandparents and I view my presence on their behalf a privilege. This is a Command with a blessing. Respect and obey your parents. Reverence or shall I say venerate them. As we grow old ourselves the obey aspect is present, but obedience is an acknowledgement of their increased wisdom and the often given direction. The Command I believe is significant of others to be honored. Luther said that the Command was also given to honor our founders, protectors, and teachers and promotes our spiritual life. Luther contended that they are the representatives of God. So directly we have in our lives two institutions to be honored, our parents and our government. It would seem that society and its structure are decreed sacred. I have reflected often on this Command, especially as my parents and wife’s parents grew old and died. I wanted to be sure I gave them the honor that was due them. That was the blessing, to honor them. Firstly, I apologize for posting out of turn. We've had Internet issues lately so this is the first chance I've had to post for a while. My original blog was about an article that I found last week. The article (and the atheist community's reaction to the article) is pretty interesting. However, as I was re-reading through some of the ACWI blogs that had been posted previously, I was inspired to edit my article blog and comment on a blog from marco paz galusha-luna on July 25. So, the article is first and my comments about the other blog follow. Christ" during a church ceremony, according to a report on myfoxorlando.com. the church in a Ziploc bag. “We don’t know 100 percent what Mr.
be the body of Christ, to show to his non-Catholic friend. .A hate crime? I know my lack of belief in the Catholic view of Transubstantiation probably lessons the severity of this act for me. Actually, my initial response to this was shock and shame for the Catholic church. Afterwards, however, I tried to put myself in a Catholics shoes- if I really believed that little cracker was indeed the flesh of Christ, perhaps I would be a little put out. Even so, wouldn't graciousness and an explanation of the sacrament been a better reaction than rage? Perhaps no. The lesson to be learned from this ordeal is twofold: 1) Know what you believe and why you believe it. During my involvement in all kinds of youth ministry, I have encountered many teens and young adults who "firmly" hold to a belief and really have no idea why. It always saddens me to see people who "hold to" orthodox Christian beliefs but couldn't debate their way out of a paper bag. 2) Prioritize. The Pharisees in the Bible are excellent examples of zealous religion gone wrong. Jesus continuously deals with the Pharisees in their wrongful prioritization of Biblical truths. Does tradition come before grace? Does love change the rules? When I don't know the answer to those questions, I go back to #1. Don't get me wrong, I am very glad that Marco got his phone back the day he lost it. I also applaud his faithfulness in God's grace and sovereignty at a time that could have been really frustrating. I love that his blog talks about God's grace and faithfulness in a way that shows that God is faithful to give us what we need/want. This theologically-based optimism is totally biblical and 100% true, but I often look at it from the other side. Before I was a Christian, I was one of those people who couldn't understand why I should believe in a God that allowed my life to be as difficult as it was. Even after I became a Christian, I felt like I was constantly being plunged under water after struggling my way up and getting a single gasp of air. I felt damaged from important things like strained family relationships and catastrophic weddings to small things like a $300 ticket for going 2 miles over the speed limit. I have a hard time dealing with the hard times until I remember that God is faithful and sovereign and just even if He doesn't deliver. My struggles remind me that I am not owed anything by the Almighty, and if I never see another blessing in my life, He will have done me no injustice. As a person who has lost many cell phones and never seen a single one returned, I can say that God is just as faithful to me as he is to Marco. loved great writers, only minor ones." different from the Soviet Union it replaced. had forced the nation to confront the horrors wrought in the name of Communism. could not name any of his books. When I heard the news of his death, I was inspired to pull out a copy of the one and only speech I have by Solzhenitsyn and re-read it. These paragraphs are even more needed today than when he first spoke the words back in 1978. I would say that the general principles extend far beyond Solzhenitsyn's comments about politics and communism; the same can be said of any form of evil that we encounter today. Very well known representatives of your society, such as George Kennan, say: we cannot apply moral criteria to politics. Thus we mix good and evil, right and wrong and make space for the absolute triumph of absolute Evil in the world. On the contrary, only moral criteria can help the West against communism's well planned world strategy. There are no other criteria. Practical or occasional considerations of any kind will inevitably be swept away by strategy. After a certain level of the problem has been reached, legalistic thinking induces paralysis; it prevents one from seeing the size and meaning of events. . .
We are now experiencing the consequences of mistakes which had not been noticed at the beginning of the journey. On the way from the Renaissance to our days we have enriched our experience, but we have lost the concept of a Supreme Complete Entity which used to restrain our passions and our irresponsibility. We have placed too much hope in political and social reforms, only to find out that we were being deprived of our most precious possession: our spiritual life. In the East, it is destroyed by the dealings and machinations of the ruling party. In the West, commercial interests tend to suffocate it. This is the real crisis. The split in the world is less terrible than the similarity of the disease plaguing its main sections. Let me know if you'd like the text of the entire speech. I'll be glad to share it. When I was a public school administrator I decorated my office with pictures I thought educationally significant and artistic. One was a painting of an old country classroom and the other a painting of the head of Christ. I have never had a problem with religious art and yet some folks do have a problem. One of my friend’s, who was aniconic, thought me to be violating the Second Commandment. Well, I struggle with that perception and do not see an infraction. We must worship God in spirit and truth. I do not worship the picture; I do appreciate the art work. The command forbids worship of a representation. This picture is not taking the place of God. The Command is against nature worship. I have often wondered if there is a greater danger in forming a mental image of God or a god. Our minds do have the tendency to wonder and exaggerate thoughts. If we magnify these thoughts of God beyond the Word, is that idolatry? (Exodus 20:5) Don't bow down to them and don't serve them because I am GOD, your God, and I'm a most jealous God, punishing the children for any sins their parents pass on to them to the third, and yes, even to the fourth generation of those who hate me. Literal bowing down does not seem to take place today. When I was a kid I watched men tip their hats as they passed the church. I considered that a form of bowing down. But I do not see that act today as hats on men are not fashionable. There is a frightening message in knowing that God can be jealous. Actually I do not think jealousy here is an emotion, but as an activity, the activity of being exclusive. God wants total homage. Now, as the song writer I think about God and am reminded of His greatness.